As an Acupuncture Physician, I have a passion for working with patients to relieve anxiety and panic. I've seen acupuncture, herbal medicine and diet and lifestyle changes work so well for many people. This program consists of 9 treatments over a period of 8 weeks. 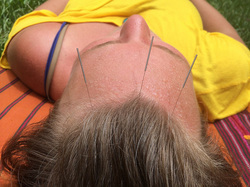 A normal course of acupuncture treatments is generally 8-12 sessions, depending on the condition being worked on. The appointments are spaced strategically throughout the eight weeks to maximize the benefit of the acupuncture, and help to move the patient into maintenance and leading a much less anxious life. First Appointment - Thorough health history is taken. First acupuncture session is delivered. Receive Lifestyle and diet suggestions for easing anxiety. Second Appointment - Follow-up acupuncture session. Third Appointment - Follow-up acupuncture session. Fourth Appointment - Follow-up acupuncture session. Fifth Appointment - Follow-up acupuncture session. Discuss how lifestyle and diet changes are going, and the impact the acupuncture is having. Discuss addition of supplements and herbal medicine to the program if needed. Sixth Appointment - Follow-up acupuncture session. Review how lifestyle, diet and supplements are working and adjust as necessary. Discuss if referrals to any other health practitioners are needed (i.e. counseling). Seventh Appointment - Follow-up acupuncture session. Eight Appointment - Follow-up acupuncture session. If patient is responding well, skip next week's appointment and start moving into maintenance mode. This week is a week off from acupuncture. We should be seeing major shifts in anxiety at this point. Ninth Appointment- Follow-up acupuncture session. Discuss progress on the program and future maintenance. Review lifestyle, diet and supplement/herbal medicine portion of the program. The cost for the program is $450. This is a savings of $105 when compared to purchasing each session individually. The program can be paid in 2 installments of $225.